New reproduction chrome hood hinges for first generation Firebird and Camaro models! Accurately stamped from high strength steel. Quality heavy construction with hardened pivot points. All parts polished then chrome plated by a TS/16-944 Certified OE supplier. 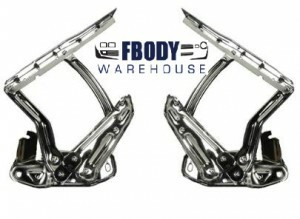 New reproduction chrome hood hinges for first generation Firebird and Camaro models! Chrome hood hinges are a great way to add value and also a light custom touch to your Fbody in under an hour! Set your car apart at the cruise night with these high quality replacements! Don't buy cheap junk when restoring and adding custom touches to your 1967 1968 1969 F body! We sell the highest quality reproduction parts, or we simply do not sell them.